Michael and Ely (my twin boys) started school today (5th grade already! ), Mr. teenager started high school (yikes!) last week. With all three in school now I decided to take a breather for a minute to enjoy some quiet time sitting outside, slowly sipping my americano and letting the sounds of nature consume me. 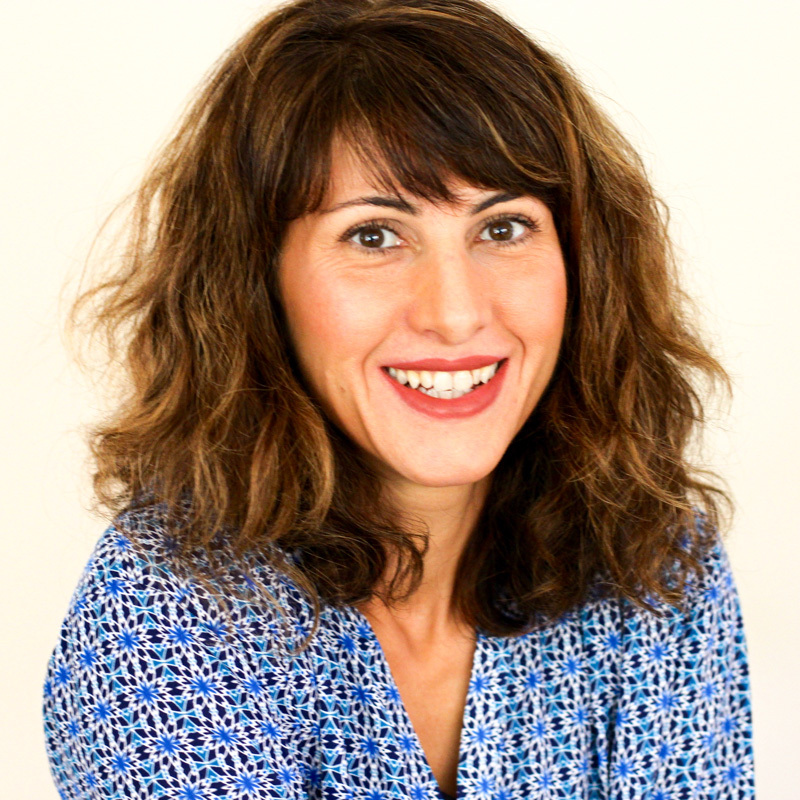 I love summer – don’t get me wrong – but I also love when the kids are in school (am I the only one here?) and so do they. They really do! The twins couldn’t wait for school to start, we have been counting down the days. My teenager wasn’t counting the days, more like whining that summer is ending for him—my guess is he is a little nervous and excited at the same time—and also enjoys getting up at noon. So now that it’s back-to-school time again I’m thinking quick and easy meals that will also do well as a packed lunch. Do you love cherries as much as we do? 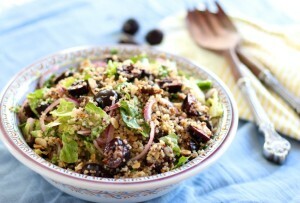 If so, you are going to love this quinoa salad recipe. I added more cherries than one may think is acceptable but heck we love, love cherries. If cherries bid their farewell near you, try seedless grapes. 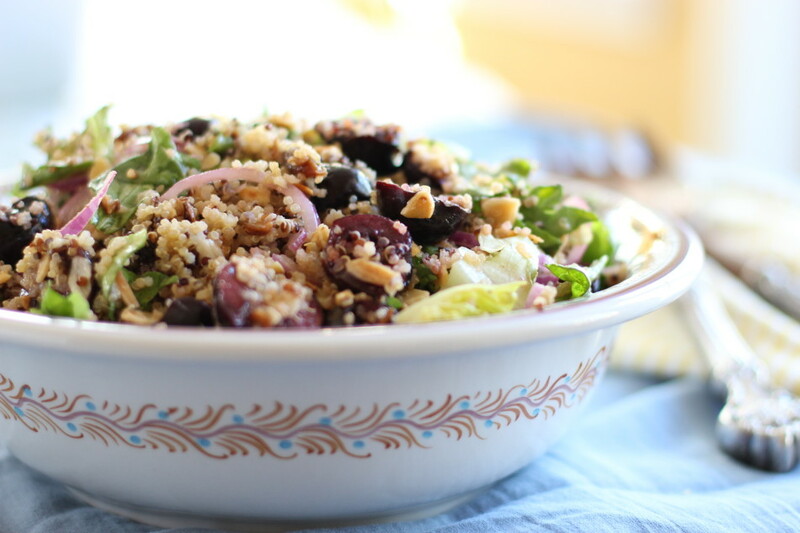 Yes, even the quinoa skeptics who think it’s just boring healthy food will love this because my friends there is nothing boring about this quinoa salad, which I owe all to the honey ginger dressing. After experimenting with just a small amount, I realized there needs to be a big jar of this in my fridge as a go-to salad dressing because, well, you’ll see when you try it. 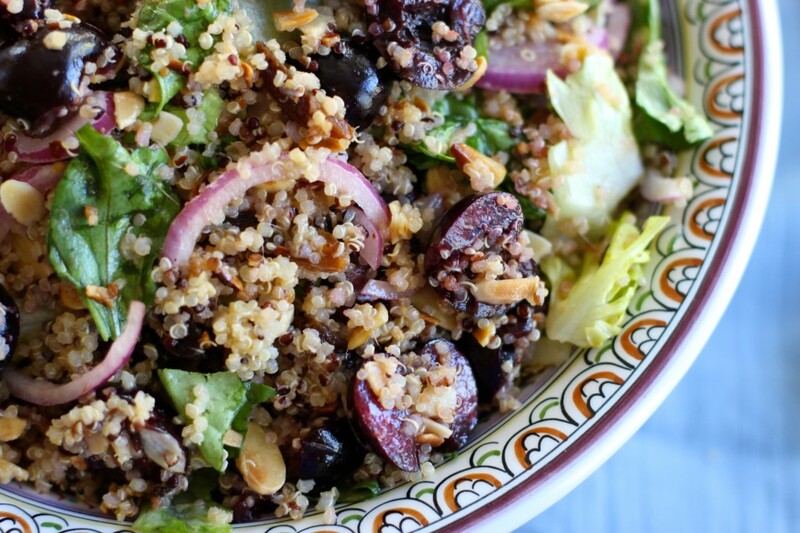 This will make a quinoa lover out of you no time. You should have seen my boys poking around in their bowls as if digging for treasure. What I love about recipes like this is how each ingredient highlights the other with flavor and texture. All was quiet at the table. Cue: make again and again. Yes to healthy, delicious and easy. Lucky me (and you) it’s easy and versatile enough to go with the seasons. Love that. Combine dressing ingredients in a mini food processor, an immersion blender or blender works well too if you’re not grating the ginger (got too lazy to grate ginger, too hot out). If you are grating, using a bowl and whisk will do just fine. Then onto the salad ingredients. I toasted my almonds for extra flavor (completely optional but highly suggested for extra nutty flavor). Use any type of nuts desired. When my oldest is joining us for dinner or lunch I will add in hazelnuts or pine nuts instead. Any type of fresh cherry is fine, no need to specifically look for “black cherries”. I prefer dark, sweet cherries. Red seedless grapes are another tasty option. Resisting a few cherries was hard. So I didn’t (hehe). After I chopped away I layered some of the ingredients before adding the quinoa (in another bowl because mixing is messy and not picture friendly) just to even things out. Not that it matters or makes any difference. Dressing will settle by the time you get to this point so pulse it again then it’s time to crank up the quinoa. As it soaks up all that honey ginger goodness. Add remaining ingredients, toss and serve! A quick and easy one-bowl meal that will have you licking your lips. 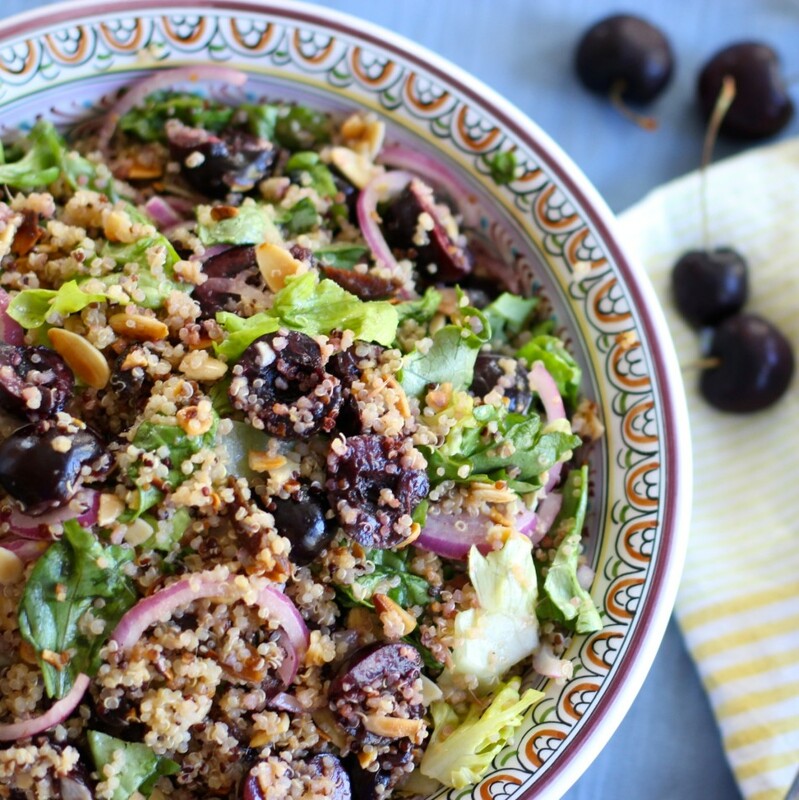 Your quinoa never had it so good as the honey ginger dressing highlights the nutty flavor of this protein-packed ancient grain paired with sweet cherries and almonds. Can be made ahead and makes a wonderful school or work lunch. Enjoy! 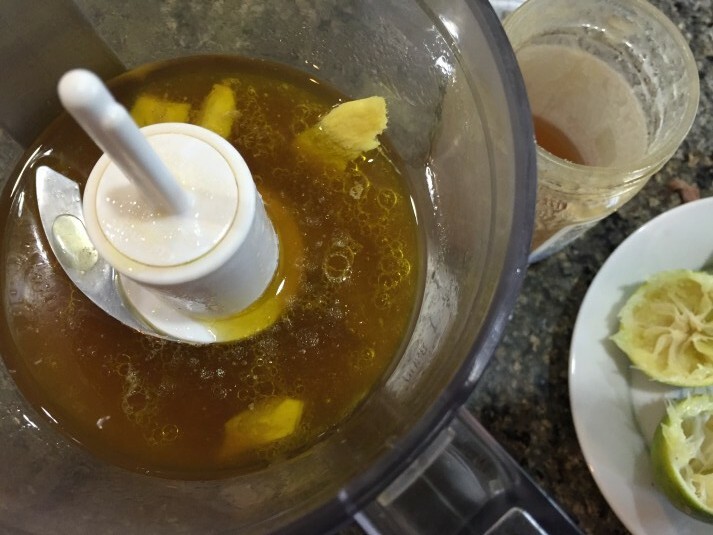 For the dressing, add all the ingredients into a mini food processor to blend well OR grate the ginger then add it into a bowl (or jar) with the remaining dressing ingredients and whisk well. Set aside. Note: This is a thinner dressing, so no need to slowly add the oil in to emulsify the dressing. In a medium saucepan, bring water to a boil then add 1 tablespoon kosher salt and quinoa; reduce heat to low and cover. Let it simmer 15-20 minutes or until liquid has absorbed (you will see air holes throughout). Remove from heat and, let stand for 10 minutes (still covered). Meanwhile, transfer the quinoa to a large bowl and fluff with a fork. 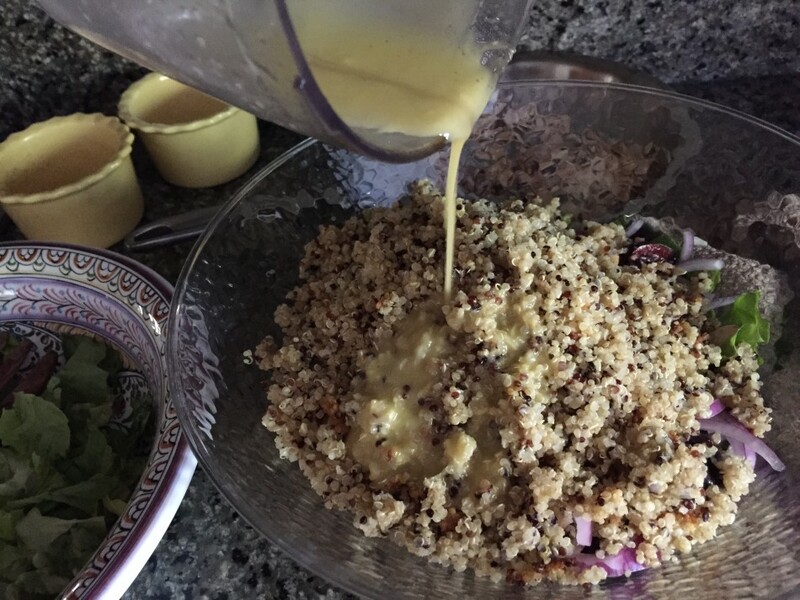 Whisk or mix the dressing once more before pouring a few tablespoons over the quinoa (add the rest later). Toast the almonds in a small pan set over medium heat (do not oil the pan) for about 5 minutes or until light golden brown; add to the bowl. 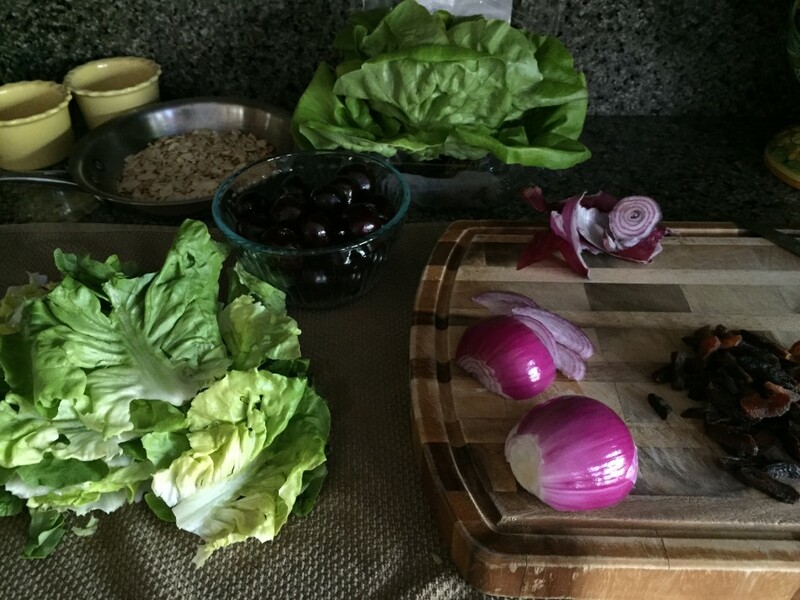 Then apricots, and red onion, and butterhead (also known as “butter lettuce” to the bowl. Toss to combine well; add more dressing and toss again. 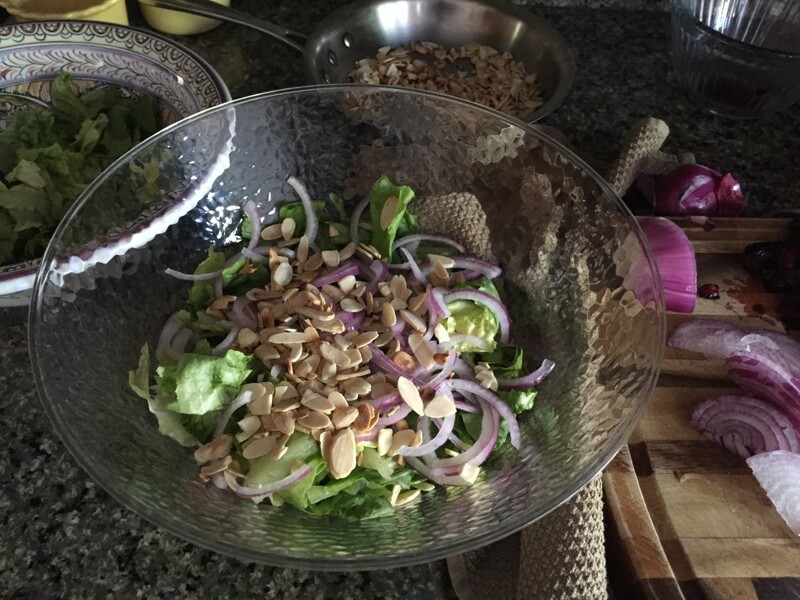 Note about strong onion flavor: If you are not a fan of raw onions in your salad try tossing the sliced onions into a bowl of ice water for 10 minutes or so. This will remove the strong onion flavor. If you prefer less dressing on your salad store any remaining dressing in the refrigerator for up to a week for another salad (goes with anything!). It will solidify a bit when refrigerated, leave out at room temperature for 30 minutes and whisk before using. Stores well, sealed in the refrigerator for 5 days. 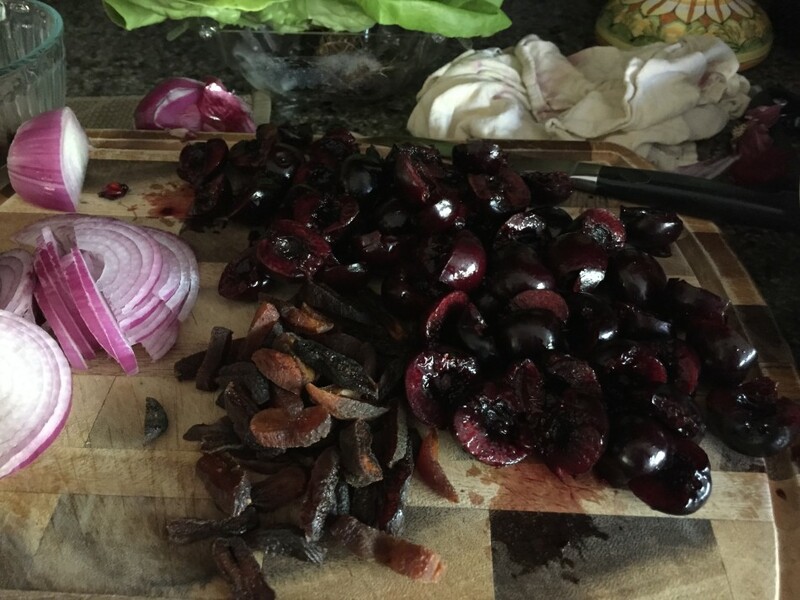 The cherries, however, will impart their reddish color to the quinoa when stored. I used butter (bibb) lettuce here but you can certainly use any lettuce variety. I also like arugula or mache. 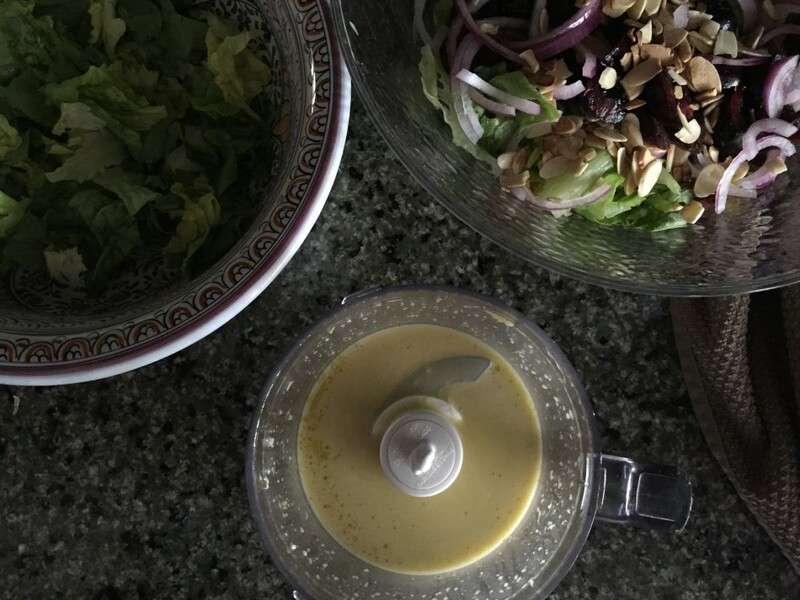 If you do use this dressing for grain-free salads such as arugula, mache, baby romaine, or baby kale it is better to make it the same day otherwise the dressing will wilt the greens the next day. If cherries are out of season, use frozen, well drained or seedless grapes, sliced. For freezing: I recommend transferring this to a large freezer-safe container with a tight lid. Storing in a freezer-safe zip loc bag may give off some freezer burn as I noticed the first time I froze it this way. This looks like a big bowl of happiness! 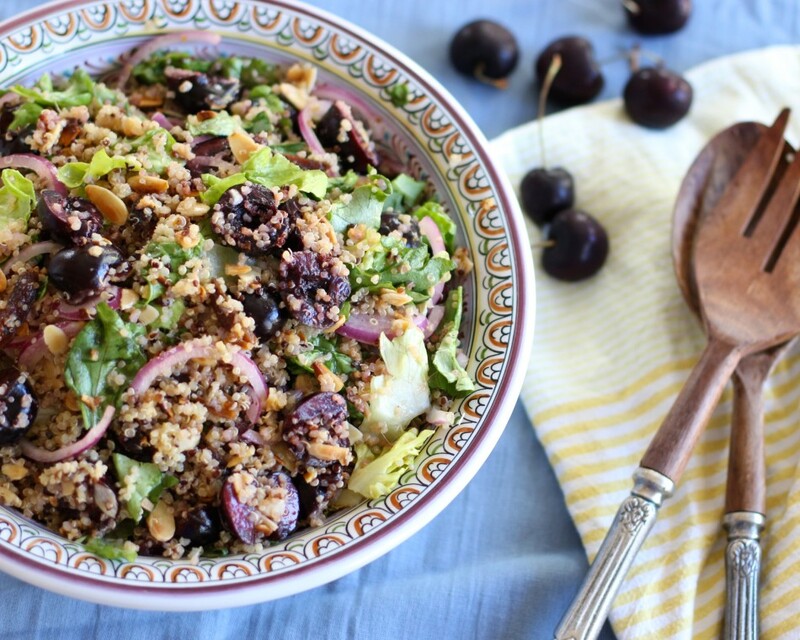 I've never had cherries in my quinoa -need to try this asap! What a great idea! I think my girls would enjoy this as a school lunch, it looks delicious! Thanks Jill, it also packs well and can be eaten at room temperature-think they will love it! What a beautiful salad and healthy is always a perk. We are also nut free and can't wait to try this with pepitas. 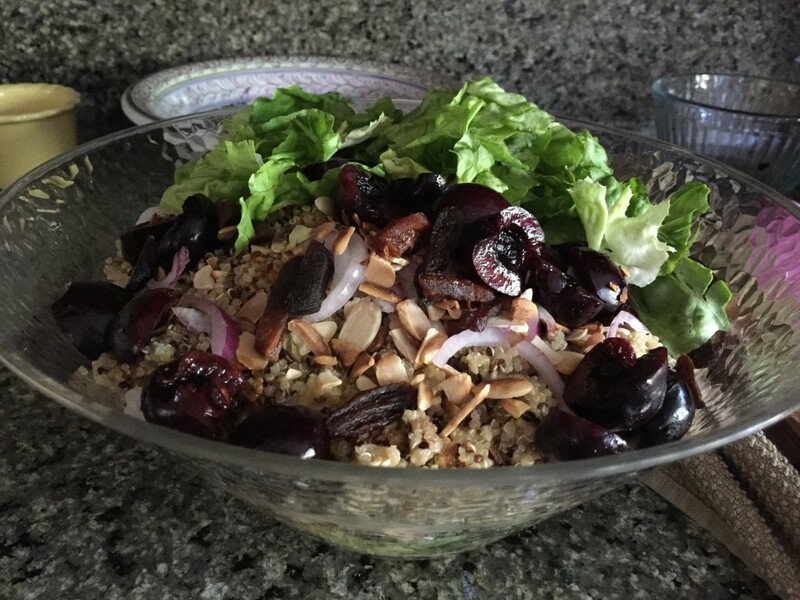 Great use of cherries, we have plenty here in Issaquah, Washington! Thanks Nancy! Pepitas sounds like a delicious substitute. I'm jealous! I wish we still had an abundance of cherries, they're few and far between now. Enjoy! Beautiful salad! (Although I don't even consider this a sald, if that's weird.) this is goodness. One question, however, can I make the dressibg in another utensil? Thank you! Thanks Linda! Not weird at all many don't, and I guess since it's filled with a grain it's not technically a salad. Regarding the dressing...you can mix it all up in a bowl using grated ginger or a (hand held) immersion blender to break up the fresh ginger chunks for a smooth consistency. Mincing the ginger really fine also works well. Hope that helps...enjoy! I couldn't agree more about kids going back to school! Mine go back Monday and I can't wait. I bet they would love this for lunch. My son's favorite fruit is grapes and think he may try this with grapes in it. I will have to make this for dinner soon :) Thanks for the easy recipes Jessica! Haha! It makes a great lunch, I gave it to my boys for their first day...and goes very well with grapes, your son will not even notice the super healthy ingredients in there! :) Enjoy! I just saw this on Pinterest and was wondering if I can use the dressing as a chicken marinade? Salad looks delicious! Yes! The flavors would make a delicious marinade and am stealing your idea Helen ;) Great idea! I am in love with this salad! 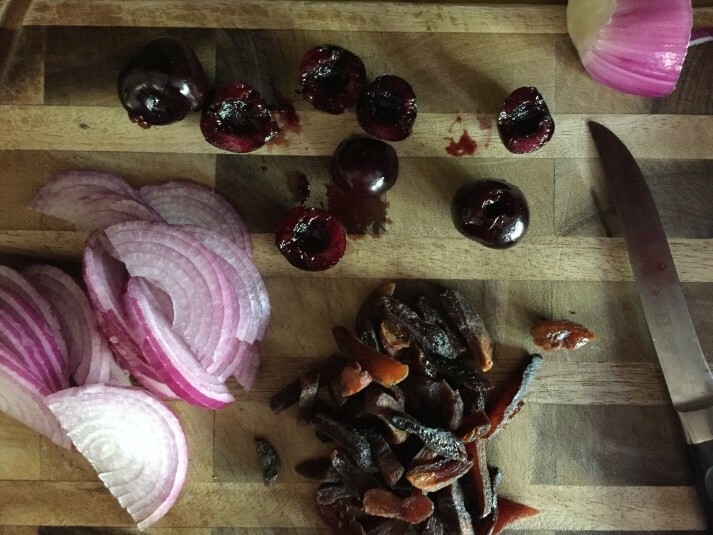 You have so many of my favorite ingredients in here:) How do I pit the cherries if I don't have a cherry pitter? I have a tiny brooklyn apartment, too little for "extras". Thanks Jessica!! This sounds ah-mazing! I like how easy this is to put together and all the cherries. LOVE CHERRIES! I don't usually get excited about quinoa but this looks amazing and I can't wait to try it! Ha! Thanks Brooke, I don't either unless it's all dressed up...enjoy! The dressing is so GOOD. I left out the dried apricots and even so it tasted delicious. Will be making this again and again, thanks! I am in love with this salad!! I have made it several times now changing up the cherries for apple or pear and finally got to say thank you! !